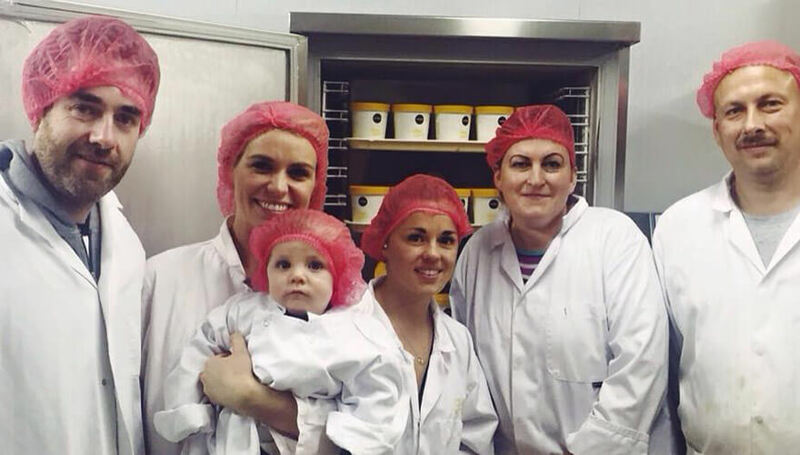 Dublin company Nobó launched its ‘Frozen Goodness’ dairy-free and gluten-free ice cream four years ago. It’s gathered a bunch of prestigious awards since then and is distributed nationwide in Ireland. You’ll also find it in stores across the UK – and in Waitrose in the Dubai Mall. Dublin.ie talked to the husband and wife team behind the brand, Rachel and Brian Nolan. Dublin.ie: Nobó isn’t some marketing gimmick, is it? It’s a real innovation. Rachel: Definitely it is in terms of the ingredients. There are other dairy-free ice-creams on the market. Where we’re different is that there’s no gums, there’s no stabilisers, our vanilla flavour only has four ingredients – and we use avocado to give it that creaminess. I haven’t seen anything in the world that replicates it. Dublin.ie: Your start-up idea: did it have to be food? Brian: I think it had to be food, I think pretty much since we met that our common area of passion has been food. When we were living in New York I think every spare cent that we scrounged together we’d save up to go to some restaurant that we’d spotted. Rachel: We used to like to try and find the hidden gems. We took the search so seriously. We’d walk around for hours looking for them. Dublin.ie: Ok. So you guys really care about food. Rachel: We thought about opening somewhere ourselves, like a restaurant which kind of led us to go to Italy to get some experience in that area. I was working in Condé Nast and it was a great job but I just really didn’t want to be in that world any more – and Brian had moved back to Ireland. Brian: We’d always had this dream of going to Italy. Rachel: So we thought why don’t we just do it? We worked in a restaurant in Tuscany for five months. Dublin.ie: And what did you learn? Brian: Our lives up to that date had been standard: do your leaving cert, do your degree, do your master’s. Rachel worked in an ad agency and I worked in the finance sector – it was kind of quite structured. Going to Italy definitely opened my mind: it was like ‘wait a second, you can actually have more control, you can do things you’re passionate about and not spontaneously combust!’. Brian: You realize that people don’t really care what you do! Rachel: We learned that we have choices. We have control over our lives. That was very liberating. Dublin.ie: And when did the ice-cream thing happen? Rachel: I’ve always been interested in nutrition and food and healthy food options – that would be something I’d read about in my spare time. And in New York there were so many healthy options available. So when we came back from Italy we thought it would be amazing if you could make something that was a treat or an ice-cream replacement but from whole foods like avocado and honey and using nothing bad. That was the seed of the idea. Brian: And then around that time a friend of Rachel’s sent on an application for the ‘Foodworks’ programme. Bord Bia, Enterprise Ireland and Teagasc had come together to develop this programme; they were looking for high-export potential product concepts that they could help to develop. So we put in the application, got called for an interview and then we were like..uh-oh! We’d better find a way to make it! So then we got into the course which was great and then at that same time we started doing farmers’ markets to test the concept. We were getting amazing reaction which again was very encouraging – because I suppose strangers were paying money to eat this crazy concoction! Dublin.ie: And the rest is history. You’ve worked in New York and Sidney? What’s the Dublin business environment like? Rachel: I think it’s great! I can’t imagine us having got off the ground as quickly in another country. There’s a lot of support for start-ups – we always feel there’s people we can call on and Bord Bia have been brilliant for export markets. They’ve offices all around the world and they’ll go out and do store audits for you, clue you in on the fit for your product in different countries. They put us in touch with our stockists in Dubai. Brian: The Local Enterprise Office were fantastic too when we were getting going. So the structured support is amazing but even the whole mindset around start-ups, the whole culture, that’s great too. Rachel: Supervalu were big for us as well because they’ve been encouraging smaller businesses to get on their shelves – but we’ve a great little community of other food producers that we’d meet for lunch and it’s nice because you need a bit of support. Dublin.ie: How do you find working for yourself now? Brian: It’s the most exciting thing and also the most challenging thing. Brian: Because we’ve created it and brought it to where it is, and knowing we can do whatever we want, that’s kind of like…whoa! That can be scary! Rachel: You can start to fall back into a pattern where you nearly forget you have that control. You get into your routine and then you’re like ‘what are we doing! We own this business! We can do what we want!’ But you suddenly slip back as if you’re working for someone else or you have to do it a certain way. The most exciting part is to be able to remind ourselves that we can take it any direction. We can do what we want. But that’s also the hardest part because you feel like you should constantly be doing more, enjoying it more. But it’s great – I’d find it very hard to do anything else now. Dublin.ie: You were joined a couple of years ago by a new member of the family, Sam. What’s his favourite flavour? Dublin.ie: Good choice. Ours too!